Nice atmosphere in a historic building located on the Ringstraße. 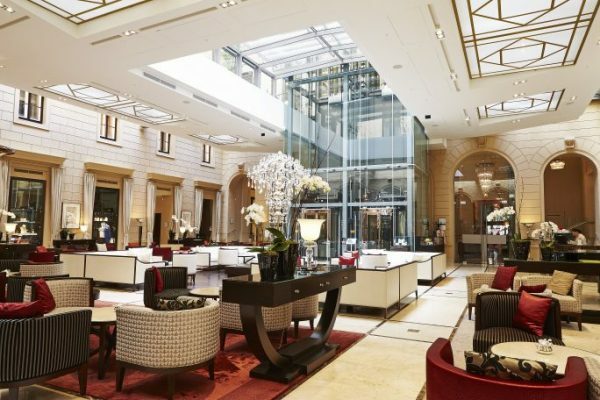 The hotel combines its rich history with a modern design, and offers an excellent starting point for a tour of Vienna. Some of the attractions drawing visitors to the Austrian capital in November and December are the countless Christmas markets filled with arts, crafts and goodies such as Lebkuchen (a baked Christmas treat similar to gingerbread) und Punsch (punch), as well as the world-famous coffee culture. The Palais Hansen’s Lobby Lounge is one of the most beautiful hotel lobbies in the city; here you can warm yourself up with a Viennese specialty coffee Melange upon arrival, to be enjoyed alongside a typical pastry. A small bell is sounded several times a day when warm apple strudels, freshly baked according to the secret recipe of head pastry chef Georg Hölbl, are brought out for guests to enjoy in the lobby. As a romantic option in the pre-Christmas season, Palais Hansen Kempinski offers its guests the option of a city tour in a traditional Fiaker – otherwise known as a horse- drawn carriage. The coachman picks up his guests from right outside the hotel and takes them on a tour through the city. Here you can enjoy Viennese Schnitzel, Tafelspitz (a traditional boiled beef dish) and the typical sweet treats from patisseries. Modern cuisine has produced many excellent restaurants, one of these being the Michelin-starred restaurant Edvard at the Palais Hansen Kempinski, which blends classical regional and seasonal dishes with top international cuisine. Chef de Cuisine, Norman Etzold and his team offer a wide range of culinary possibilities at the Palais Hansen – from the award-winning gourmet restaurant to culinary events at the restaurant ‘Die Küche’. In addition to this, you have the possibility of trying the hearty signature dish in the Lobby Lounge: Käsekrainer, a cheese-filled sausage accompanied by horseradish, mustard and bread. Vienna is world-famous for its rich musical heritage and countless composers who chose the Danube metropolis as their home and workplace. The annual highlight for classical music lovers is the city’s New Year’s Concert, which is broadcast live in 90 countries. January is also the start of the ball season with 450 dance events taking place across the city. The Vienna Opera Ball has also become world famous, attended yearly by international guests and celebrities. General Manager of the Palais Hansen Kempinski, Gerhard Mitrovits, has also played his part in making the tradition of the Vienna ball known around the world. He has already set up nine balls in various cities, including Beijing, Moscow, New York and Jakarta. Housed in a heritage-listed Palais on Schottenring Street. It is part of the famously glamourous Ringstrasse boulevard. Sights like the Burgtheater, St. Stephen’s Cathedral, the Parliament building or the Rathausplatz square are only a few minutes’ walk away. The Renaissance Revival architecture combined with innovative touches like iPad check-in and an iPad version of the traditional hotel information covering everything from room service to outdoor activities create a symbiosis of Viennese tradition and present-day zeitgeist. The charming palais accommodates 152 rooms and suites, two restaurants, one bar, a cigar lounge, six function rooms, a ballroom, a florist, a fitness and spa area, also open to day spa guests, as well as 17 private residential penthouse apartments on a total of seven stories.